Part food. Part history. 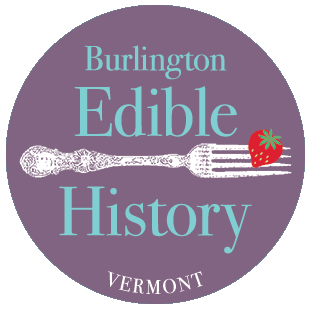 Vermont’s Burlington Edible History Tour takes you back in time to connect the history of Burlington’s early ethnic groups to their food traditions, when farm to table was a way of life. Over a 2-mile walk, you’ll discover the local history and food traditions of Abenaki, African Americans, Chinese, French Canadians, Germans, Greeks, Irish, Italians, Jews, Lebanese, and Yankees. To celebrate their traditions of eating local foods – often from their backyards – we will sample food at five restaurants that serve local foods: Sugar Snap Catering at ECHO, Monarch and the Milkweed at Maglianero, The Gryphon, Penny Cluse, and Deli 126. 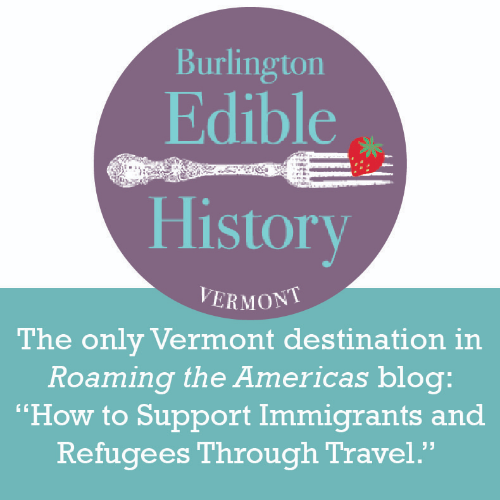 This tour offers a different side of Burlington’s rich history. As tour co-founders, together we uncovered stories about various cultural groups, their food businesses, and food traditions through extensive research. Our historical heroes are the owners of small grocery stores, who kept neighbors fed during the hardest times by letting them buy with IOUs, often ripped up at the end of the year. Our heroes include the women who not only grew food and cooked for their large families, but also fed any hungry person who came to their doors. In the spirit of our community’s past, we are donating 10% of our profits to the New Farms for New Americans project, which provides affordable farm land to refugees so they can stay connected to their own culinary traditions and crops. We offer customized tours during our season. Contact us if you are looking for corporate team-building, alumni group events, or any special group activity. PLEASE NOTE: This tour starts outside at the back of the ECHO Center.